This Chopped Ramen Noodle Salad with Grilled Teriyaki Turkey is loaded with flavor and texture. It perfectly delivers the ying and yang of sweet and savory. Loving Minnesota in the summertime is easy. With all its opportunities for enjoying the outdoors + (mostly) incredibly awesome weather from late April through early November, it’s nearly an effortless ask. I’m pretty certain that summer is the very reason that Minnesotans tolerate winter so well. The only negative to summer, if you can even call it that, is trying to cram in all the freshness and outdoor dining of the season. 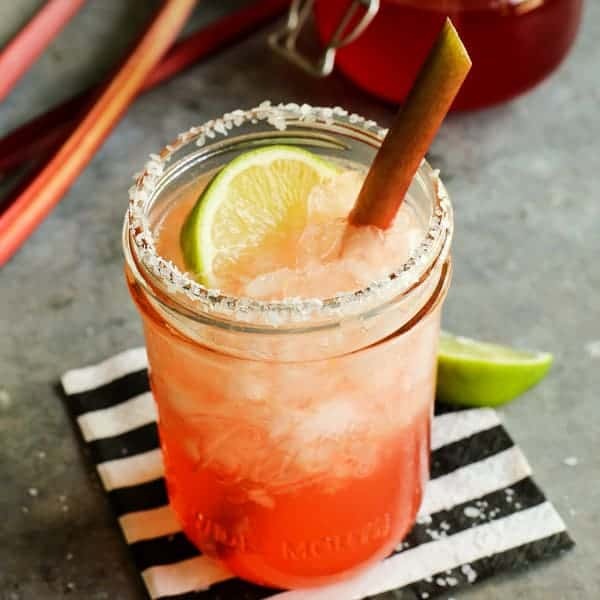 I always have a stack of recipes on the ready, for salads, grilling, cocktails, and entertaining in general. It’s a never-ending attempt to squeeze in all that deliciousness! Every summer, it seems that we add at least a few new recipes to our list of regular repeats. And this Chopped Ramen Noodle Salad with Grilled Teriyaki Turkey is destined for that list. There’s so much good stuff going on here, I just know you’re going to love it too! *Here are a few more salad recipes I’m loving right now: this gorgeous Grilled Zucchini Salad with Lemon-Herb Vinaigrette, this fresh chopped Fattoush Salad, and my Individual Caprese Pasta Salads. * This is a sponsored post, created in partnership with Minnesota Turkey, to celebrate Turkey Lovers’ Month in June! Growing up, one of my favorite salads was one made with chopped bok choy, broken ramen noodles, and an awesome Asian dressing. I’m guessing you know exactly the one I’m talking about, as it seemed to appear at nearly every potluck. Well this chopped ramen noodle salad is my grown-up twist on that old favorite. 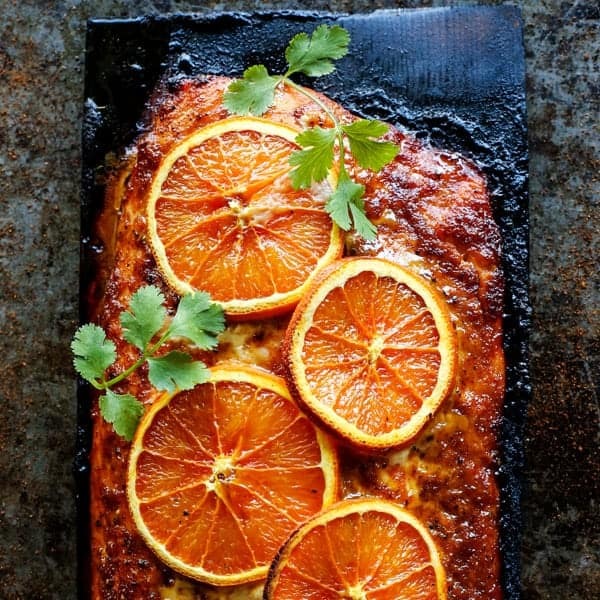 This new recipe adds beautiful fruits, plus protein in the form of grilled teriyaki turkey. The salad is light and refreshing, yet filling. It’s a meal that’s built especially for summer. There’s no cabbage in this ramen noodle salad recipe. 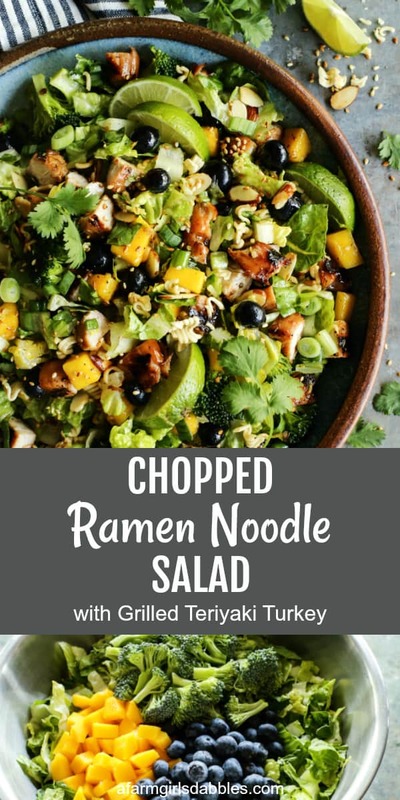 That’s very different from the recipe I grew up on, and the countless variations of ramen salad you’ll find elsewhere in a quick search. Instead, I rely on the fresh green sturdiness of crunchy romaine lettuce and bite-size broccoli florets. Add to that some sweet, colorful blueberries and mango bites. 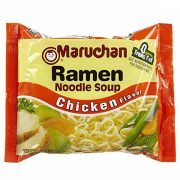 Plus a fun mixture of crunchy, toasted ramen noodles, sliced almonds, and sesame seeds. And I’m pretty much in salad heaven. The dressing for this Asian noodle salad is bright and tangy with fresh lime juice and rice vinegar. A touch of sesame oil offers that lean on Asian flavors that I find completely addictive. 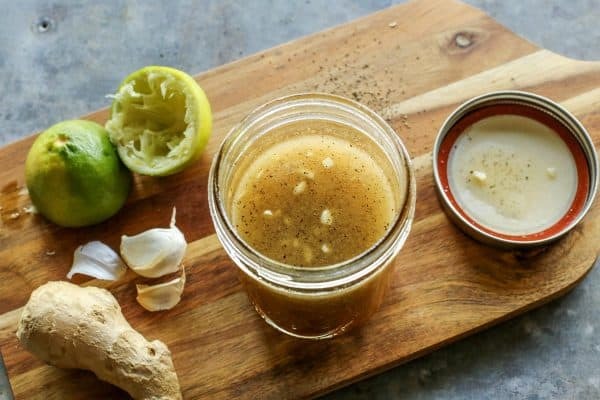 And fresh ginger and garlic…well, I can’t imagine this dressing without it! 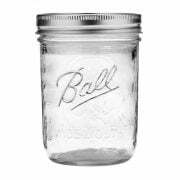 I like to add all the ingredients to a pint jar, cover it, and shake vigorously to bring it all together. Turkey breast tenderloins have become one of our favorite options when we grill. They’re a great source of lean protein and can take on rich, bold seasonings and marinades very easily. Maybe you remember our recipes for Grilled Brown Sugar and Whole Grain Mustard Turkey Tenderloin and Grilled Chipotle Orange Turkey Kebabs >>> both of these, so good! 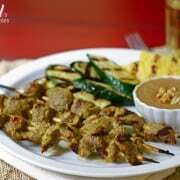 For this recipe, I slice the tenderloin about 3/4″ thick to create smaller “turkey steaks”. 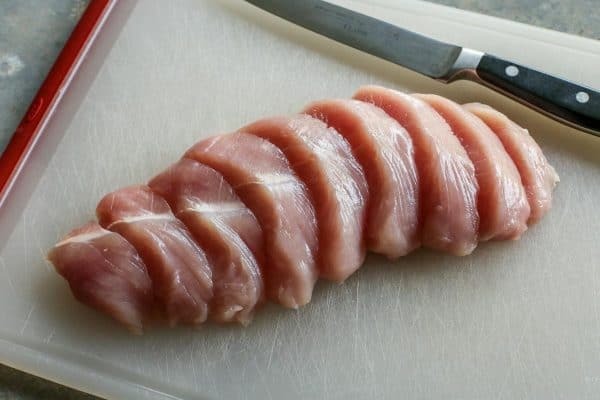 This allows the teriyaki marinade to cover more surface area than if I were to leave the tenderloin whole >>> delivering more flavor per bite. And another bonus? These smaller pieces cook up super quick and easy! I am partnering with Minnesota Turkey again this year to share new turkey recipes with you. Minnesota ranks No. 1 nationally in turkey farming, with 450 farm families committed to raising healthy flocks. These farmers provide barns where the turkeys are free to roam (they are never in cages), while being protected from weather and predators. They also abide by the FDA’s ruling from the 1950’s that declared growth hormones and steroids illegal in poultry. Want more info about how turkeys are raised? These Turkey Truths videos can provide you with more facts. Making my own teriyaki sauce provides me with an almost unreal amount of joy. It’s probably because I never even thought of the possibility of making my own until I was in my 40’s. I love to create this famously flavorful sauce using simple ingredients from our pantry, with soy sauce at the heart of it all. It comes together easily, with added beauty from fresh ginger and garlic (those ingredients show up again here!). The teriyaki sauce makes a great marinade and basting sauce for the turkey pieces. Of course, if you’re looking to shave some time off of this recipe and already have a bottle of teriyaki sauce that you love, feel free to use it. I won’t get all judgy on you. Marinate the turkey pieces in the homemade teriyaki sauce to infuse them with flavor. And then give them a second blast of teriyaki while they cook on the grill, with a final brushing of reserved sauce. To serve this ramen noodle salad, I simply toss all the fresh ingredients together, along with a mixture of toasted ramen noodles, almond slices, and sesame seeds. I simply adore all that crunch! Then I fold in the grilled teriyaki turkey. Oftentimes I’ll drizzle some of the dressing over the salad and give it another toss. Other times I like to serve the dressing on the side, for everyone to add to their own individual salad as they please. And I highly recommend offering fresh lime wedges for squeezing over the top, right before eating. 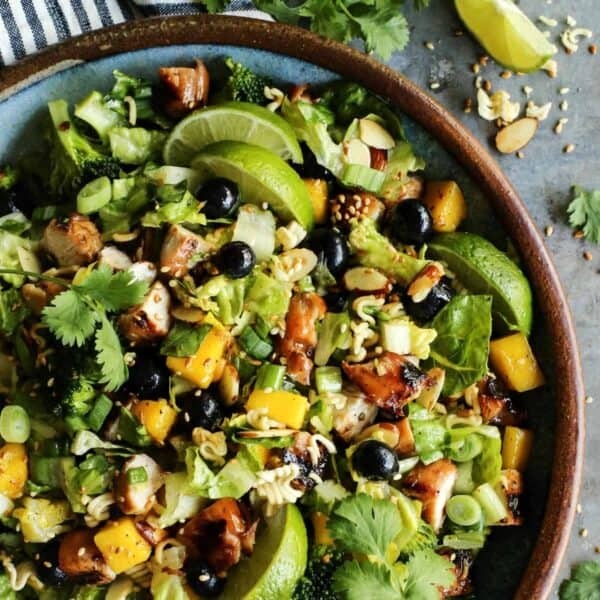 That final squeeze of fresh lime zing is just the perfect ending to this salad story! When a salad delivers the ying and yang of sweet and savory, it’s always a win-win for me. And this chopped ramen noodle salad with grilled teriyaki turkey is very clearly a winner. *Here are a few recipes I’d like to try: this California Cobb Salad from Fifteen Spatulas, Bruschetta Orzo Pasta Salad (our kids LOVE orzo!) from Rachel Cooks, and this Summer Italian Spaghetti Salad from Reluctant Entertainer looks very fun! This salad is loaded with flavor and texture, providing both sweet and savory notes. And with the addition of grilled turkey, it's truly a meal all on its own. 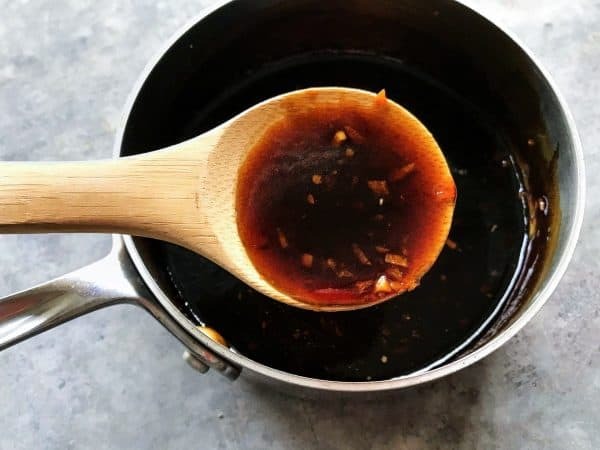 for the teriyaki marinade and grilled turkey - small saucepan over medium-high heat, stir together soy sauce, honey, brown sugar, sesame oil, rice vinegar, garlic, and ginger. Bring to a boil. In a small bowl, whisk together water and cornstarch. While whisking the soy sauce mixture, slowly pour cornstarch mixture into soy sauce mixture. Turn heat down to medium to medium-low and simmer until thickened, about 5 minutes or so. Let teriyaki marinade cool to room temperature. Reserve 1/4 cup of the teriyaki marinade. Place the remaining marinade in a low, wide bowl and add the turkey pieces, turning to completely coat each piece. Cover and refrigerate for 4 to 6 hours. Heat grill to medium-high heat. Make sure grates are scrubbed clean and then oiled. (To oil the grates, add some canola oil to a small bowl. Then fold a heavy paper towel a few times to make a smaller square. With tongs, grasp the folded paper towel and dip it into the oil until the paper towel is drenched. Then run the paper towel over the grates, repeating until all grill grates are thoroughly oiled.) Place marinated turkey slices onto hot oiled grates and grill for about 3 to 4 minutes per side, brushing each side once with reserved teriyaki marinade. 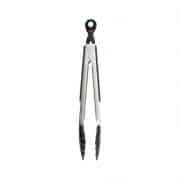 Turn turkey with tongs or a spatula (piercing the meat will let juices escape! ), until each side is nicely charred and internal temperature reaches nearly 165° F. Remove turkey pieces from grill and let rest to reach 165° F.
for the chopped ramen noodle salad - In a skillet over medium heat, melt the butter. Add broken ramen noodles and almonds stirring to coat. After about 1 minute, stir in the sesame seeds. Stir mixture periodically, until lightly browned. Remove to a plate to cool completely. 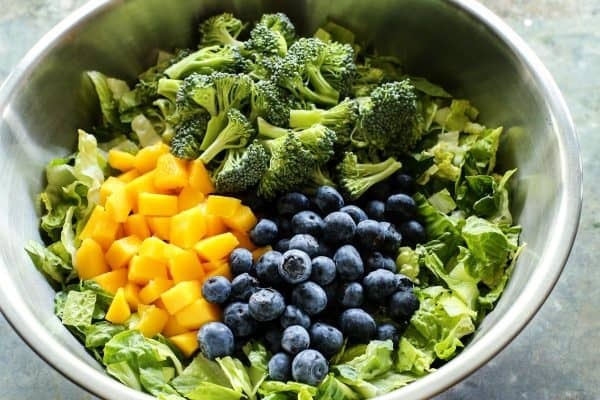 In a large serving bowl or platter, toss together romaine, green onions, broccoli, mango, blueberries, and cilantro. 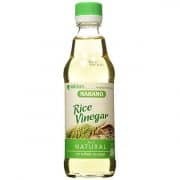 for the vinaigrette - Combine vegetable oil, lime juice, rice vinegar, honey, sesame oil, soy sauce, ginger, garlic, and black pepper in a pint jar. Cover jar and shake vigorously, until mixture comes together and emulsifies. It should look completely cloudy, no longer separated. 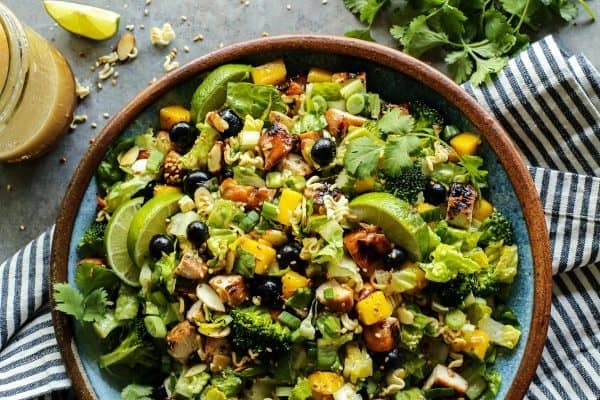 to serve the salad - Chop the grilled teriyaki turkey into bite sized pieces and fold into the salad mixture. Either drizzle the salad with the prepared dressing or offer the dressing on the side, for everyone to add as they please. Offer fresh lime wedges to squeeze over the top right before eating, for an extra punch of bright freshness. 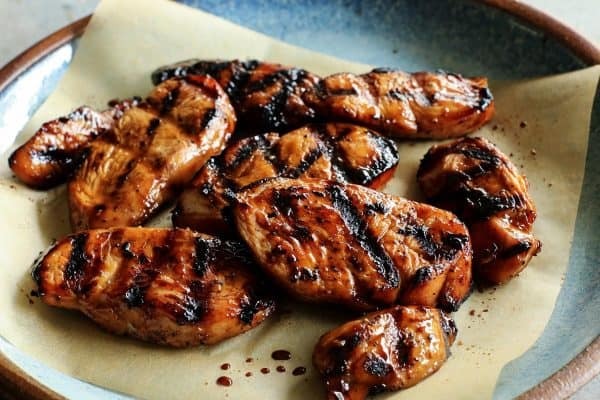 The homemade teriyaki marinade is awesome good - but if you have a favorite teriyaki sauce from the store, feel free to use that to save some time. For more information about the Minnesota Turkey Growers Association, including recipes and nutritional information, visit their web site. Also follow along on these social media channels: Facebook, Twitter, and Pinterest. Join in on the conversation using #ServeTurkey and #TryTurkey. This post is sponsored by our local Minnesota Turkey. All opinions are 100% my own. Thank you for supporting the brands that help make this site possible. Love a good ramen salad. And with turkey? A great summer meal! Hearty salads like this are my favorite for summer. 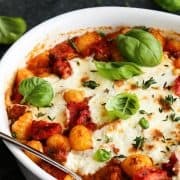 I never get tired of them, and this recipe looks incredible! I love a salad meal! Thanks, Erin – Happy Summer!! This looks like a bowl of goodness! I can’t wait to try! I know you’d love this! Thank you! All I needed to see was sweet and savory. Count me in! Those two components are huge for me as well. Thanks, Matt – happy weekend! I need to make this! 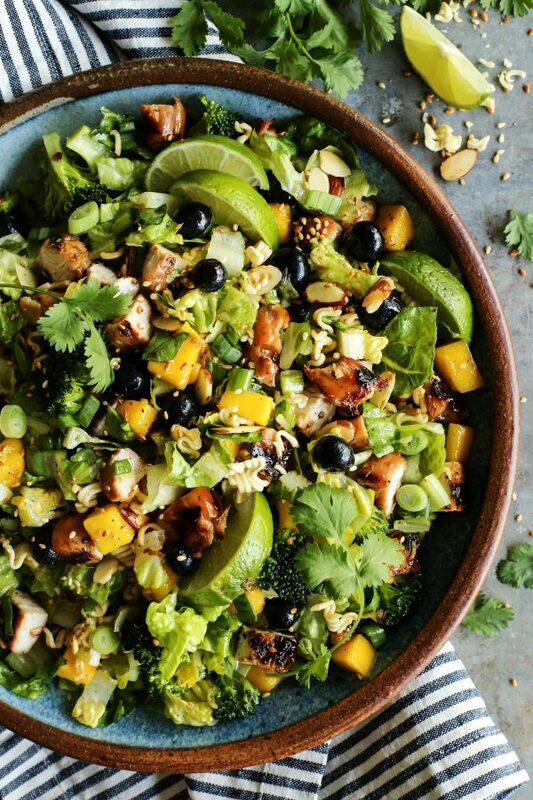 Love that you’ve added mangoes and blueberries to an already amazing salad! That fruit really is the most beautiful finishing touch! Thank you so much, Liren – happy weekend to you! Adding ramen into salads is one of my favorite things! Love that turkey too! Isn’t it just so much fun?! Thanks, Taylor – happy weekend! 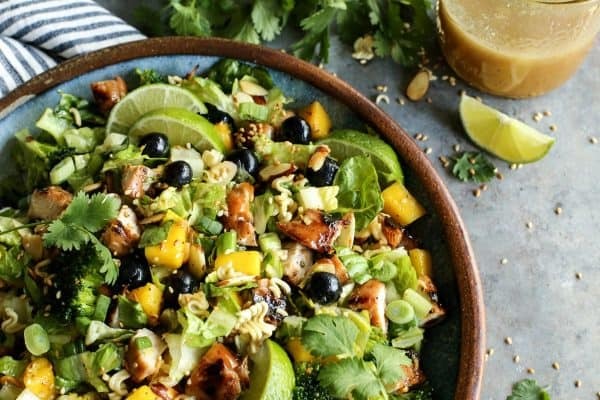 thank you for this, hadn’t seen these ingredients together in a salad before and love the marinade for the turkey, plus the blueberries for sweetness, almonds for crunch, etc. Thank you, Sabrina. So many good things going on in this salad! This looks so good! Making your own teriyaki sauce is the best! Definitely trying! Homemade teriyaki sauce is almost drinkable!!! Thanks, Lauren – happy weekend! 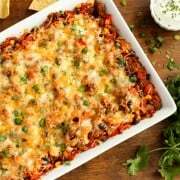 Love this recipe,putting it on my grocery list to make. Thank you, Dolores – enjoy!